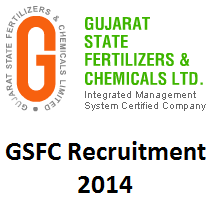 Gujarat State Fertilizers & Chemicals Limited Invite Online Application for GSFC Recruitment 2014. Qualified Candidate Must Read Full Advertisement and Apply Online Before Last Date Through Official website. GSFC worked since 1967 in Gujarat India.